During the Japanese version of today's Animal Crossing Direct it was revealed that the mysterious 3DS title Miitopia launches in that region on December 8th - and it's getting its own Direct broadcast in just a few days on 5th November. That's a quick turnaround for a title which we still don't really know much about, aside from the fact that it uses Mii characters. We'd imagine that Miitopia will launch in the west next year, but in the meantime, we'll at least have this Japan-focused broadcast to fill us in on the finer details. We'll cover live on 5th November as always, from 4am Pacific / 7am Eastern / 11am UK / noon CET. Wow, Nintendo is so Surprising during this month. The direct is for JP only, and no dates for the rest of the world ? Is this gonna be a Japan exclusive (linked to an event / objects sold separately such as gashapons etc) ? For some reason, that image reminds me of Little King's Story, which would probably work quite well with Miis as the villagers... but it's unlikely that there'll be any connection, as there's no mention of Marvelous, who own the rights to Little King's Story. @NintyFan Oh... you can make movies using Miis. Kind of meh... but it is free. I'll be giving this a download in December. 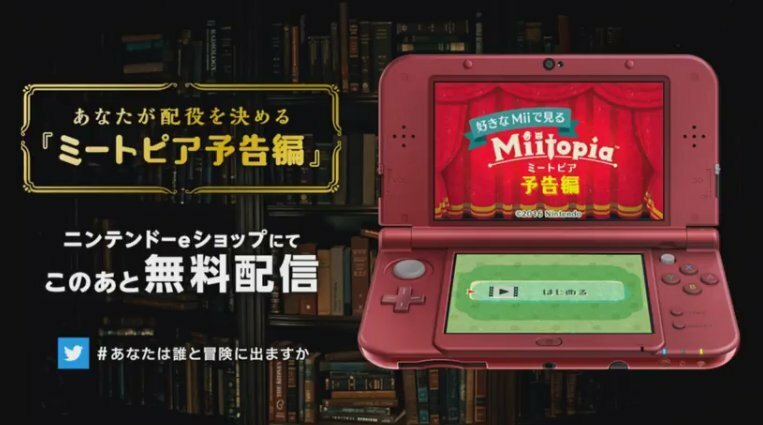 There's a quick movie demo on japan eshop on miitopia, seems kind cool. @NintyFan Thanks for the link. Can't read a lick of Japanese, and the Google translate isn't exactly flowing in proper English, but it looks like you don't play it, you make a movie and take some stills to post on Miiverse? Seems like simple fun. And if it's free so much the better, people on the live feed were saying the screen said 4,700 Yen somewhere. Who knows, maybe there's a free demo to make pics first and the movie making game costs $50? this looks very much like a sakamoto thing. I enjoyed the little demo they put on the eshop. it lets you view several introduction videos for the game but the twist is that they use mii characters of your choosing. How far into the game do you have to be to get the magic lamp? Eh Mii's will continue to fail in the west, nobody cares, everybody uses facebook messenger and whatsapp or one of a million variants.